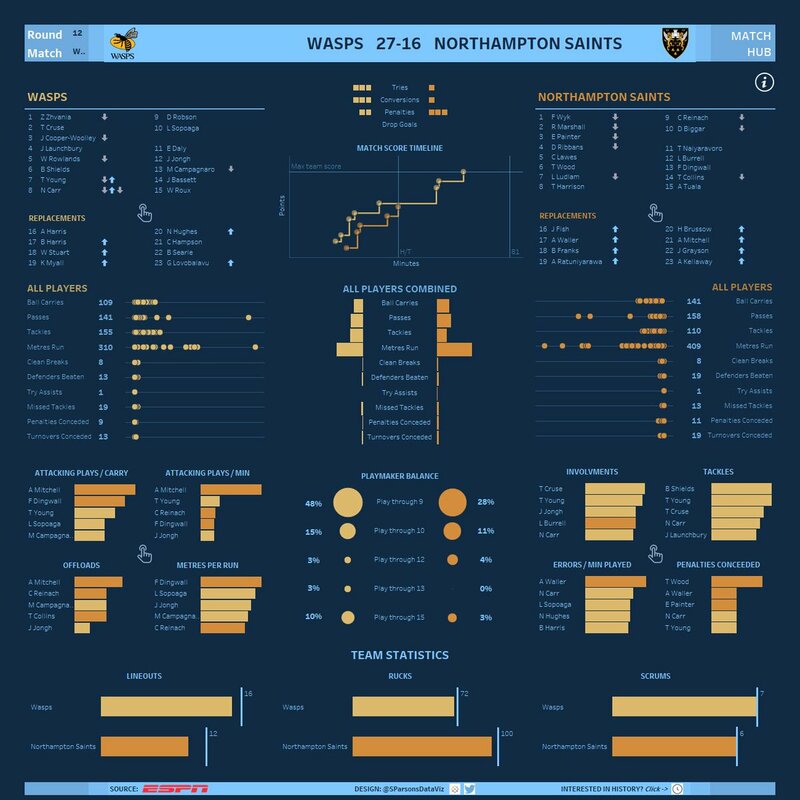 Apologies to anyone that has been trying to use the dashboards I had put together with this season's match stats, I hadn't updated them in a few months UNTIL NOW! Ha. Essentially changing jobs in that time was the main cause, along with being frustrated with Baths form (funny how you don't want to look at stats after a loss!). Anyway the dashboards have been updated now with the last 6 rounds of matches. Go take a look and discover for yourself who is performing in what metrics, individually and collectively. Just found how to post the images. Click the link about to get to the interactive data. You need to get out more! I think thats a compliment BathSalmon. Just looking at two stats. That is an incredible piece of work that demonstrates serious dedication! From a strictly technical point of view its an excellent dashboard. 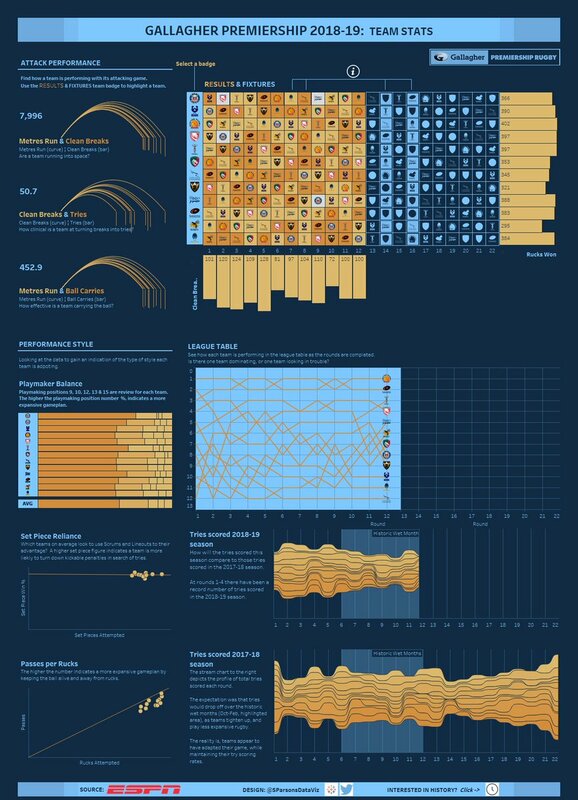 Very clear, easy to use and most importantly to me, easy on the eye. Thanks everyone, I appreciate the comments! I'm still looking to add to it as well. .......I think thats a compliment BathSalmon. I do hope you take it as such, because anyone who can represent data in the way you have, has a very special and valuable talent. Don't worry I didn't take that badly! There is an element of truth in it as well! 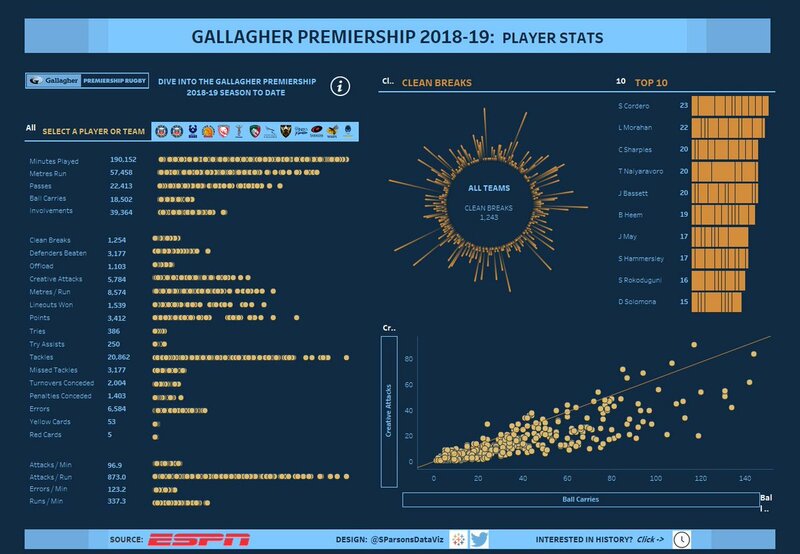 Its a good point... We could only dream that ESPN or Premiership Rugby could show stats in such an interesting and easy to use way. Having the data is one thing but being able to use it is another. I am sure the clubs get data packaged like this but for someone to do it for the benefit of the fans is great. Over the years i have often tried to make a point on here and elsewhere using facts/Statistics but it usually takes a lot of time and effort. Thanks. Interestingly a performance analyst for one of the national sides has contacted me on Twitter to say it's better than what they are given from certain companies! Which is great feedback. As for Wayne Barnes, you shouldn't need to worry about that much longer!! Corbus has 6 tries not 5! This is the issue with not controlling the source data. At some stage ESPN have decide to rename Corbus. I can fix. V. frustrating. Many moons ago, I was taught history by someone who had written a history text book - he gave his then students 6d ( I did say many moons ago!) for any errors found. Until the second print run. Never did find out how much it cost him!